What refreshes your spirits more than a stroll through a country garden? Give someone special an arrangement that inspires the senses. 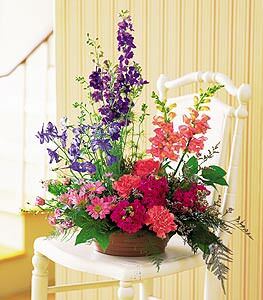 Carnations, chrysanthemums, delphinium and larkspur arrive in a country-style saucer. Just a note to thank you for the second delivery of flowers. This second arrangement lasted more than TWO WEEKS and I still have a carnation in bloom with greenery and some lavender. Even the roses lasted a full week. Thank you again for replacing the original order. We are very pleased with your response. Thanks a ton! The woman I spoke with on the phone was very nice & helpful.